Spa using the famous "Jamu"
Bali Spa It’s renewal open in April 2009, Frangipani is the first spa of specialize JAMU by collaborated with the JAMU Medicine Corp. in Indonesia! 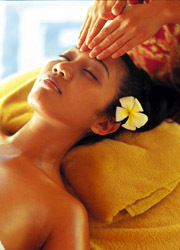 All products using in the spa are 100% natural JAMU. In addition, Frangipani use only the high qualified carrier oil for dilute aroma oil, so it’s safe for sensitive skin. 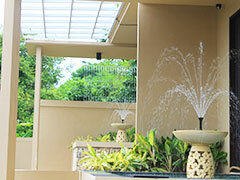 Along with Frangipani Spa Cancel Regulation, we ask transfer payment in 7 days advance before your departure. Thank you for your understanding. All the products they use for the treatment is their original brand, RAHASIA & TAMBA which contains 100% natural Ayurveda herbs. For the facial treatment, they completed TAMBA which is the first cosmetics ptoduced by the No.1skilled doctor in Bali and JAMU Spa Franginipani which is gentle and safe on the skin. Aqua Medical Pool provide water therapy which provide therapeutic treatment using jet stream, improving muscle pain, reducing cellulite, promote metabolism. 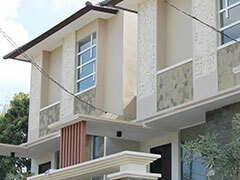 We prepare 6 standard room with 12 beds. 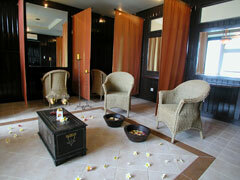 The great package to enjoy the private spa in VIP room including meal! You can choose and take your favorite treatment course from the menu in the private VIP room. The simple brown color based room with a bath room was made by natural woods. You can stay in the room another 60 minutes after the treatment to relax until the last moment. Enjoy the special 60 minutes taking a jaccuzie and having a meal and fresh juice with the vew of harbor! 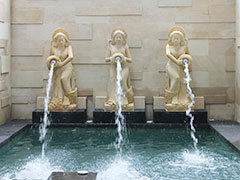 The 3 types of the Bath courses: Wine Bubble Jaccuzie, Herb Detox Bath and Flower bath are available. Note that Flower Bath and Herb Detox Bath are in a regular bath. This special program is especially designed for releasing mental fatigue or stress relieve. Begins with Abiyanga full body massage, then, melt your tense with hot stone massage follow by jamu healing body scrub of Balinese secret remedy and Thalasso flower bath to supple your skin. Your body will be pampered head to toe with our Facial Stone Massage, Shiro Dhara and Creambath to feel heavenly indulgence. this facial stone massage improve blood circulation with stimulating lymph system and blood circulation, effective for tone your skin and face lifting. *1 Please select body massage from　Abiyanga massage or Balinese massage. *2 Whats “Spa Buffet”? you can select from‘half facial’（*3）／foot reflexology／neck&shoulder／. It is hard for men to take care of skin pore. 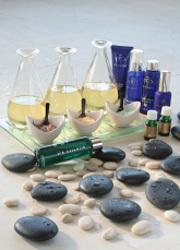 ‘TAMBA’ Mens Aromatherapy Facial is specially designed for men’s needs, focusing on skin cleansing to feel totally fresh. Begins with special sliming massage focusing on pressure points for body shaping. This effective lift-up massage will give you a great effect for hip up, curving waist and beautiful bust. Combination of coffee powder from Mt.Kintamani in Bali and secret remedy of jamu clay from ancient Javanese Royal beauty ritual will make your skin glow and radiant. Blissful facial and creambath complete your make-over. Please note that Facial Cleaning treatment may cause temporary skin rushes for sensitive skin or clogged pore skin. This will recover in 2-3 days though please select Aromatherapy Facial for guest expects ‘big day’ to follow. This exotic treatment brings you a unique spiritual moment. Enjoy blissful exotic stone massage follow by chakra treatment using seven precious gemstones and mystique Shiro Dhara will ease your tense and lull you into a state of deeply relaxed and harmonious bliss. ※This menu will be a standard room. If you are using a VIP room, an additional charge will occur. This special treatment approaches 'self-hydrating' power in our deep tissue, improve our natural hydrating function of our body from the inside. This aging care treatment will firm and supple your skin. Recommended for early aging sign or prevent small wrinkles. The healing power of long slow stroke reach very deep in your muscle, this deep tissue treatment release chronic muscle tension by direct pressure. Using strong pressure technique with finger, thumb and elbow, relax the muscle in the deep stage. Also recommend for total revive. This wonderfully relaxing foot reflexology using Turle oil blend with secret remedy jamu to soften and smooth your hard dried heals is a great way to pamper your feet and refresh yourself. This is a healing treatment passed along in Ayurveda, the traditional medicine of Hinduism. A thin stream of warm oil poured on the chakra called the third eye will relax your brain's nerves and ease stress. This course is also recommended to you by using Aromaoiruessensu sensitive skin. Relaxation of its rich flavor and aroma oils, esoteric whitening refreshing and proven Java + Oganikkuhabukurei Shibata use, leading to a beautiful skin complexion beautifully appointed. It remove dirt and sebum which filled with the pore by thorough cleansing. Remove darkish skin of the face and make healthy and cleanliness skin. Finish facial with a feeling of refreshing transparence. Eye treatment,Shampoo and blow including. If you drive a lot of rice, you will also be a light oil and red nose when rare. Reddish few days, but always draw, do not worry if the course here please. Therapist choose hair cream much your scalp and hair condition and fix balance of mind and body by a relaxation fragrance. A dirt of the sebum which a pore of a scalp was clogged up with remove it, and improve a flow blood circulation. Hand, shoulder, foot massage are included, too. Stretch combination of Thai and Indonesian expression, captured the intense massage Totsu pot tightly. While wrapped in your favorite scent in the aroma, take the stiffness and fatigue, you will heal deep. Smooth flowing meticulous massage combined with essential oils of high purity will rid the body of toxins while firming the lower half of the body and relieving the legs of swelling and fatigue. 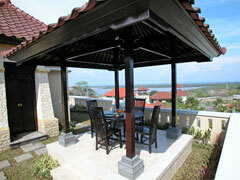 Free Area: Nusadua, jimbaran, kuta, sanur, seminyak. On your last day in Bali, they can keep your luggage. The children of 10-14 years of age receive, offers a kids menu. Prior transfer payment is needed 7 days before your departure. Please bear the expense of transfer by customer. 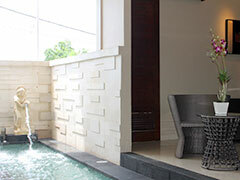 ※All the menus can be done in VIP room (except Half Day Aqua Medical Treatment). After the treatment, you have another 60 minutes to stay in the room and use VIP facilities. Massage with Ayurvedic oils make me feel good and also make the skin smooth and soft! The oil warms the body and relaxing the tension in nerves. 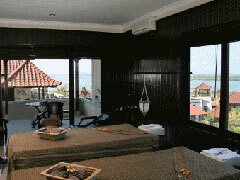 Before that, during my stay in Bali, my whole body felt languid though I slept very much at hotel room. I feel good after had this treatment.